Awais Ahmad doesn’t fit the usual profile of an organic, local food proponent, nostalgic for the days of local farming and regular visits from the milkman. In fact, given his background as an investment banker, he might seem quite the opposite. But it’s actually through his business lens that Ahmad sees a growing market for exactly that service, and he’s trying out his hunch in Northeastern Pennsylvania. In September, Ahmad and partners V.J. George of Nanticoke, Pa., and Thomas Job from New Jersey opened what Ahmad calls “a hybrid between a grocery and a convenience store” in the Mountain Top suburb that overlooks Wilkes-Barre and the many small towns of the Wyoming Valley. Ahmad recently moved to the area so his children could be closer to his in-laws, and he believed there was a market for his idea. 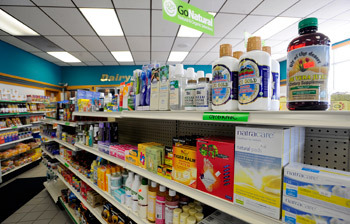 The store, Good2Go, offers the usual conveniences–candy bars, newspapers and snacks–but also markets premium options such as locally baked breads and pastries, organic eggs and glass-bottled milk from grass-fed cows living on the other side of the valley. And the overwhelming response gave him an idea. Starting this month, Ahmad is making organic foods purchases even easier by bringing them to customers’ doors. His company is hiring two delivery drivers and buying two specially made refrigeration trucks to deliver the products it sells in its store to area homes and offices. Currently, the service is offered only in Luzerne and Lackawanna counties and limited temporarily in some rural areas, but Ahmad hopes to expand throughout the region and along the Pennsylvania Turnpike’s northeast extension. The return of a service that died in the rush to make everything cheaper and more efficient comes at a premium: each delivery includes a $3 charge and prices per product are higher than they are in the store, which are already higher than most dairies and bakeries, as well as basic milk and bread products at the local supermarket. But Ahmad is betting people are willing to pay for the convenience, nostalgia and superior products. Ahmad’s research prior to opening the store took him to Rhode Island, where the delivery business never dried up. He rode along with deliverers, whose well-established itineraries include entering empty houses, replacing stock and reorganizing customers’ refrigerators. Ahmad isn’t sure if his business will get that service oriented because of the liability issues, but he’s very conscious of the importance of quality deliverers. Ahmad’s proposal was like a dream come true for Chet Mozloom, executive director of the Lands at Hillside Farm. He had always hoped to see the farm’s products delivered, but the business idea didn’t fit into the farm’s nonprofit structure. The plan would bring Ahmad’s refrigerated trucks to the farm, where the refrigeration units will be charged while farm workers fill them with specialized crates of bottled milk. Other products, such as bread, will be supplied by the Mountain Top store or retrieved from the producer directly. 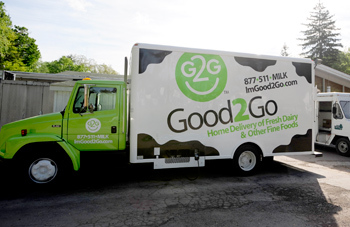 Mozloom isn’t sure what effect the side business will have on his dairy, which markets its own “Gold” milk and ice cream along with products from other local farms. But he hopes it becomes more than the farm can handle. “It would be our dream to not be able to make enough of it, so that we had to approach another farmer,” he says. Initially, the drivers will make between 50 to 70 deliveries per route, but Ahmad hopes to have seven to 10 trucks making 350 deliveries per route every weekday within 18 months. From there, Ahmad is looking into replicating his Mountain Top store in other affluent, suburban areas where he believes consumers, especially parents, are willing to pay for these products. 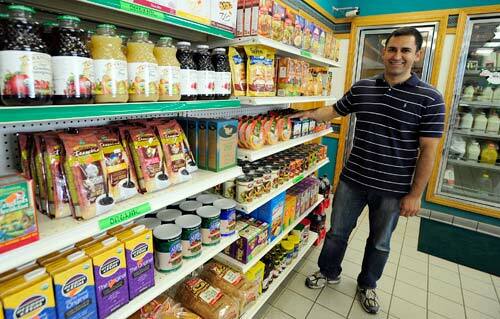 Owner of Good2Go grocery Awais Ahmad. 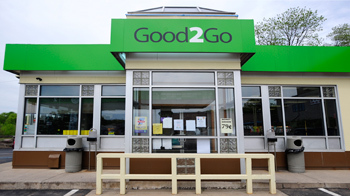 The Good2Go grocery on Mountain Boulevard in Mountain Top, Pa.
Good2Go market carries a wide variety of organic products. 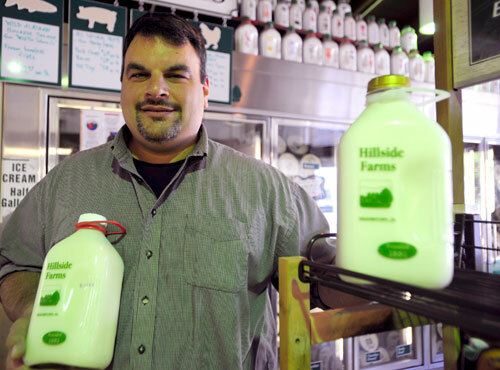 The grocery store will soon be delivering milk from Hillside Farms dairy. Chet Mozloom, Executive Director of the Lands at Hillside Farms.